Fun fact: In much of Europe, kale was the most widely consumed leafy vegetable until the Middle Ages, when cabbage surpassed the greens in popularity. Today, kale remains one of the most nutrient-dense leafy greens available (click here for the WF nutritional profile). 1. Wash and dry the kale thoroughly (may also want to de-stem). This can be somewhat labor-intensive in my experience, so if you can buy a prewashed package such as the kind they sell at Trader Joe’s, that will simplify the process. Or if you have a salad spinner for drying, that will also save you some time. Just be sure the kale is WELL DRIED before baking, or you will end up with soggy chips! 4. Drizzle olive oil and sprinkle seasoning (sea salt, garlic, nooch, etc) on top. 5. Bake for about 30 minutes until the leaves are crunchy. Shown here with some carrot-flavored flax crackers. Warning: these chips take much longer to make than they take to consume! 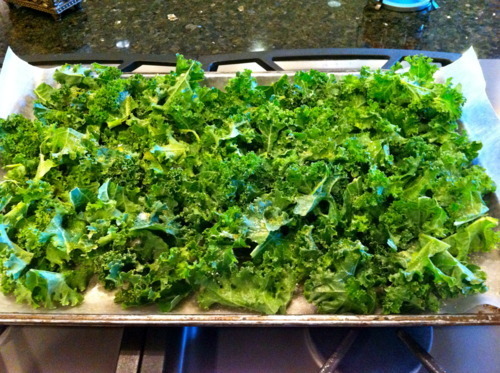 Looking forward to attempting these in a dehydrator after the holidays…(Santa request pending of course). Lastly if you prefer to purchase your kale chips, that is an option as well; kale chips are becoming increasingly popular and widespread these days. 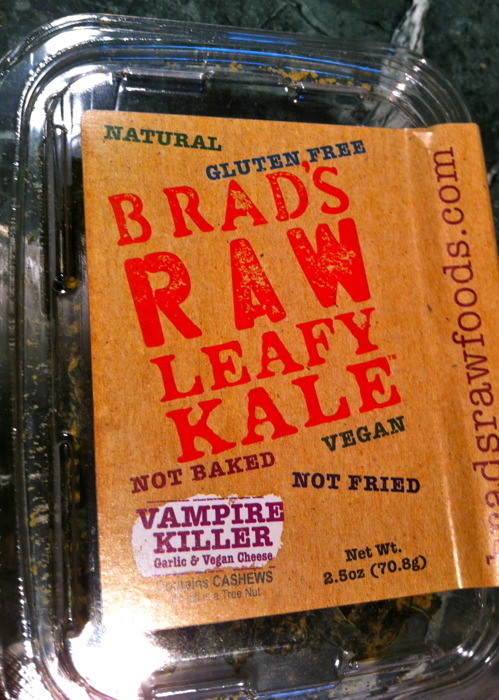 I’ve sampled many of the packaged varieties, and Brad’s Raw Leafy Kale is one of the best brands on the market. In fact on the Today show just a few weeks ago, Brad’s variety were publicly praised by Hoda (good or bad endorsement?!). 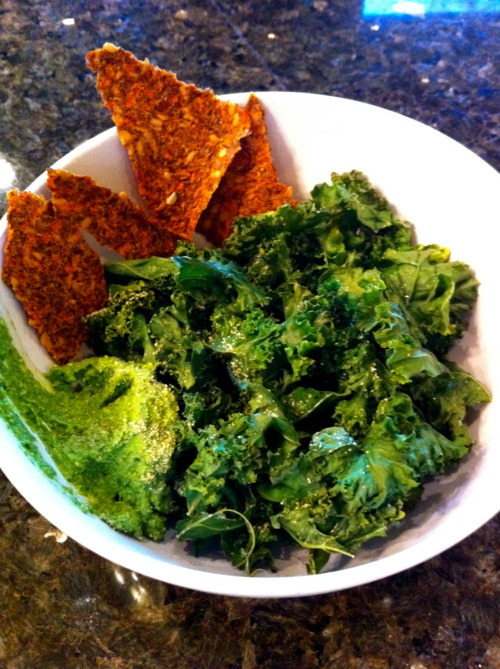 I must try Kale chips! Persuading the rest of the family to try them may be difficult though since their first experience of Kale was not a good one lol! It’s not a vegetable we can buy easily in the UK though I love it! Thank you! I subscribed to yours the other day!